Sean Dyche has backed his players to bounce back at Bournemouth tomorrow. The Clarets suffered only their third defeat of the season, in controversial circumstances, on Sunday, as Arsenal snatched a 1-0 win in injury time. 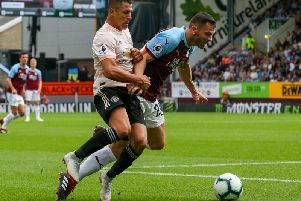 Alexis Sanchez scored from the spot after James Tarkowski was adjudged to have shoved Aaron Ramsey in the box. It was the third-successive time the Gunners have beaten Burnley with a contentious late goal, but Dyche doesn’t dwell on disappointments, and he said: All I know is that we are continuing to improve I feel, and there were good signs of that again. “That is the over-riding thing, but there is obvious disappointment not to get something out of the game. “The lads are flat because it is last minute, but not flat because of the performance, and I made it clear to them that that performance is a sign that we keep moving, and that is over a season. The first half, in particular, was as well as Burnley have played all season, and Dyche added: “There were some good performances all round – certainly you wouldn’t look at anyone as the weak-link, and I think that is where we are improving. “It’s raising your minimum – can you raise your minimum? We all know on a maximum day, teams in the Premier League are very good, no matter if you are a top, middle or bottom side. “It is about raising your minimum. What about the days when it is a quiet one? What about the days when you haven’t been quite as effective? Can you raise it? Can you still be productive? “I think we are showing signs of that.